**COPAVIEW SPECIAL - Stay Friday & Saturday nights and get 3rd night free (excl. holidays). Luxury by the Sea - a unique coastal retreat with a Hamptons feel perfect for both summer and winter getaways and for anyone looking for the ultimate beach-side escape. ** Pls do not include the free night in your enquiry - simply request it in your correspondence. Gorgeous new family friendly beach house only 3 mins walk to beach, cafes, parks etc ideal for families, group of friends and retreats. Enjoy dinner on the balcony overlooking the ocean, under the stars on the back deck or at the large oak dining table next to the beautiful sandstone fireplace. View glorious sunsets, spot whales and dolphins and watch surfers catching waves all whilst relaxing on the huge top balcony. Whether you are a surfer, a beach-lover, corporate group, family with children of any age or friends looking for a relaxing break the CopaView Beach House is the perfect holiday destination. * breathtaking 270 degree ocean and beach views. * 3 mins walk to beach, shops, cafes, restaurant, playground, small skate park and lagoon. Note: The beds are 'hotel-style' split Kings so can be separated for singles into 2 extra long singles so suitable for adults of all sizes. Bath towels and bed linen are supplied so just let me know which bedding configuration suits your group and beds will be made up for your arrival. The 2 sets of bunks are ideal for children and teenagers (and spritely adults). For an additional fee we can also supply beach towels ($15 each) or a 'starter' grocery pack so that all you have to do is arrive, unpack and relax. Please enquire. Open plan Family room with sandstone fireplace adjoining Dining room and main Kitchen, Balcony, 3 Bedrooms and 2 Bathrooms/ Laundry and a separate Toilet. Courtyard with clothes line. Living room, huge Balcony with dining and lounge areas, Kitchenette, Bar and 4th Bathroom. If you are after some pampering we can arrange our yogi, beauty therapist or chef to come to the house and indulge you with massages, facials, manicures, pedicures and many other special interests - eg meditation, yoga, cooking, book clubs, mahjong, tennis etc. We also cater to special interest groups (please enquire) and as all King beds can be split into 2 single beds the house is also perfect for retreats and small corporate groups. Let us make your dreams a reality. Please contact me with any questions or for more information. All enquiries welcome. 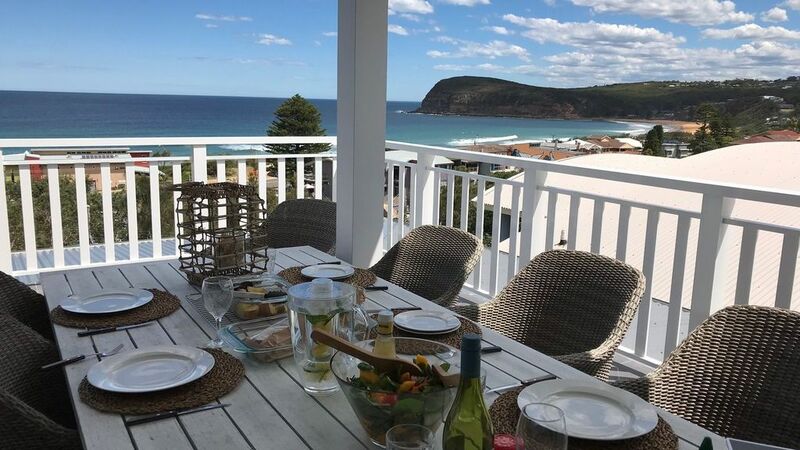 Copacabana is a sleepy seaside village with gorgeous unspoilt beach which adjoins Macmasters Beach. Surrounded by Bouddi National Park it is a perfect getaway destination for families and/or those who just want a relaxing holiday! Copacabana is a destination in itself, close to other popular spots such as Avoca and Terrigal but without the crowds. Copa is famous for its east point break so if you are a keen surfer you won't be disappointed. It's only a 5 min drive to Avoca and 15 mins on to Terrigal for more surf plus cafes, shops, boutiques and restaurants. Copacabana is patrolled all Summer and has one of the best point breaks on the East Coast. Macmasters ( a short walk down the beach) offers more great surfing, swimming, coffee and dining opportunities. In Copa, there are a number of cafes (some play live music) and take away shops including a kiosk at the Surf Club with views over the ocean, a general store, hairdresser, bottle shop, take-away stores, pharmacy, doctor's practice and news agency and there are many more cafes and restaurants only five to ten minutes drive at Avoca and Terrigal. For the kids, there are playgrounds, parks, small skate park, beach, rock pool, lagoon, fishing, surfing, swimming, bush walking and much more. The Copa lagoon and rock pool are great for families with young children or for snorkelling and/or paddle boards. Copa is close to all amenities - ocean boat ramp, Crown Plaza Resort (Terrigal), surf beaches, restaurants, golf courses (at Gosford and Woy Woy) and driving range only 10 mins away at Kincumber where there are also more shops, a cinema supermarket and Hotel/pub. Only 5 minutes drive to Avoca Beach with old time cinema and paddle boats on the river and a 20 minute drive brings you to Erina Fair Shopping Plaza (with ice skating rink, cinema complex etc) and access to Brisbane Water for more water sports.. Surrounded by national parks & inland waterways there is plenty to do - swimming, surfing, tennis, kayaking, fishing, prawning, boating and bush-walking. Get fit walking the hill to Captain Cook's Lookout and read extracts from his logbook on his travels in the area with views all the way back to Sydney. You'll find a Whale watching platform although you can also spot whales during the migratory season and pods of dolphins right though the year from one of our own front balconies. By car, you can explore lots of little bays along the coastline, enjoy a coffee at the Arboretum at Pearl Beach, or lunch at Belles, or take a ferry from Ettalong or Wagstaff across to Palm Beach and enjoy lunch and a girls shopping expedition (ferry runs hourly). For the golfers there are courses at Gosford and Woy Woy as well as a driving range at Kincumber. Fisherman's Wharf at Woy Woy is good for seafood and pelican feeding times are worth watching. For art lovers you can visit the Gosford Regional Gallery at West Gosford with its lovely Japanese Gardens, coffee shop and gift shop. Gallery 460 near Kincumber also has a gallery and huge sculpture park definitely worth a visit. Other activities on the Central Coast to keep the kids amused include the Australian Reptile Park at Somersby and WiIdlife Park at Calga. My family has always loved being by the beach and the children have grown up playing on the sand, in the waves and doing Nippers since they were 3 years old. We love to escape the hustle bustle of city life and enjoy the relaxed atmosphere and beautiful scenery of Copacabana. Our dream was to have a family beach house within easy reach of the city yet would feel like we were a million miles away. After 10 years creating many happy family memories we decided it was time to renovate our old 'beach shack'. After 2 years of planning and another 2 years spent building we achieved our dream and now get added enjoyment from sharing our beautiful beach house and the lifestyle it offers with other like-minded people. We wanted to preserve the original charm and character of the old house and so we kept the high ceilings, exposed beams, timber panelling and odd shapes wherever and whenever we could. What has resulted is a truly unique beach house that fulfils all our modern day requisites and luxuries but is not bland or lifeless. There is also an outdoor shower with hot and cold water. Infloor heating on ground level and all bathrooms for cold winter days & nights. Front loader and small supply of clothes detergent provided. Dryer plus a large clothes line is also provided for outdoor drying. Parking for maximum 4 vehicles (2 in Carport) provided. Other vehicles can be parked in car park opposite surf cub (2mins walk) or further down the street. There is undercover parking for 2 vehicles and room for another 2 cars on the driveway. Quality bath towels, hand towels, bath mats, face washers and tea towels provided. Beach towels are also available for $15 each (these must be requested in advance). Large double door french style fridge with freezer drawer. Electric cooktop. Pots and plans supplied. Nespresso machine and starter pack of pods provided. Feel free to bring more of your favourite Nescafe blends. Basic condiments incl salt and pepper, tea, coffee, sugar, oil and vinegar and some sauces provided. Huge variety of quality kitchenware provided to suit entertaining a large group. Beautiful oak dining table near the fireplace overlooking the ocean. State of the Art Sonos Sound system plays on all 3 levels. A Ping Pong table can be set up in the Car port. Bats and balls supplied. Some books and magazines provided. Wii, Nintendo 64 and X-Box consoles and games supplied. Feel free to bring more of your own. Some beach toys for younger children provided. Fully landscaped garden at front and rear with sandstone walls and seating. 2 balconies at the front of the house overlooking the beach and ocean with spectacular views. Spot a whale, watch the surfers and check out the swell before heading down for a swim. There is a large timber veranda at the entry level to the property plus 2 balconies above and another timber deck at the rear. All have seating areas and beach and water views. At the rear of the house is a large timber deck adjoining the garden and BBQ area. Complete with dining table and outdoor seating. Tennis courts are located approx 10 mins walk from the property and can be booked via the local news agency. BYO racquets and balls. Golf courses approx 20 -30 mins drive. A masseur, private chef and other special requests can be catered to. Please enquire when booking. We stayed for a long weekend over summer '18/'19 and could not fault the property. Lisa (owner) was a great host, full of information and very welcoming. The house itself is a perfect mix of modern and beachy, plenty of room for groups/families and being only 150m to the sand is a novelty that few can claim! The entertaining terrace on the top floor was our favourite part of the house - we will definitely be back. My family and I had a very memorable and comfortable stay. Definitely returning for another stay in the near future. Thanks for your positive comments and so happy to hear you enjoyed your stay and are planning to return again. It was a pleasure to have you all and thanks for taking good care of the house. This house was great for an extended family holiday. plenty of space for all family activities but enough room for a little private time. Beautifully maintained. walking distance from beach and shops.Views are just wonderful.The whole family loved every minute of it. Recommend it to all without any reservations. We had an extended family Christmas holiday at CopaView (14 of us ranging in age from 72 to 2). Lisa was a very thoughtful host - providing extra beds to accommodate teenagers and, as a total surprise, even put in a Christmas Tree, lights and decorations .. magical!! The house is arranged over 3 levels which gave plenty of spaces in which to either enjoy company or sit quietly. At 4 minutes walk to the beach and the shopping strip it couldn’t have been more conveniently placed. We would definitely return.. thank you for a great holiday Lisa! Thank you so much for your lovely review Toby and Mary-Jo (and family). I'm so happy you enjoyed your stay and it's nice to know the little extras are appreciated. Thank you for taking great care of the house and I look forward to your next visit :). The new CopaView Beach House is located about 3 mins easy walk to the beach and lagoon and is surrounded by beautiful Bouddi National Park. There is a small number of shops, cafes, restaurants plus the surf club about 100m away and plenty of other activities and amenities including cinemas, shopping centres, restaurants etc about 10-20 mins drive. There are so many beautiful little bays and inlets to discover by foot or by car. More information is available - just let me know what you are interested in.